Director discusses current production of “Chinglish” at EWP. 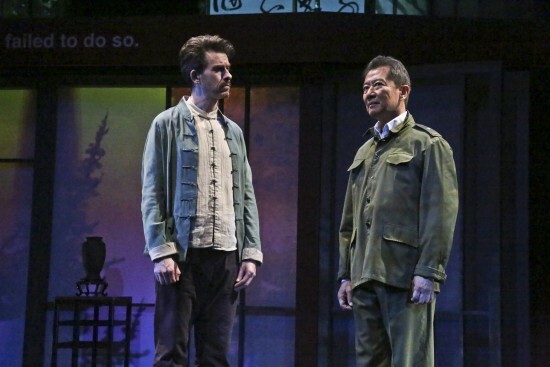 But David Henry Hwang’s “Chinglish,” now playing at East West Players, explores much more than that, looking at misunderstandings and mistaken assumptions on both sides, compounded by interpreters who either aren’t competent or have their own agenda. The comedy stars Matthew Jaeger as Daniel Cavanaugh, an Ohio businessman trying to make a deal to produce English-language signs in the provincial capital of Guiyang, and Kara Wang as Vice Minister Xi Yang, who is trying to help him — or is she? — by telling him what is really going on behind the scenes. The cast also includes Ben Wang as Minister Cai Guoliang and Jeff Locker as Peter Timms, Daniel’s interpreter. Although most of EWP’s productions are about Asians or Asian Americans, usually all of the dialogue is in English. “Chinglish” is unique in that much of the dialogue is in Mandarin, with translations projected onto the set. 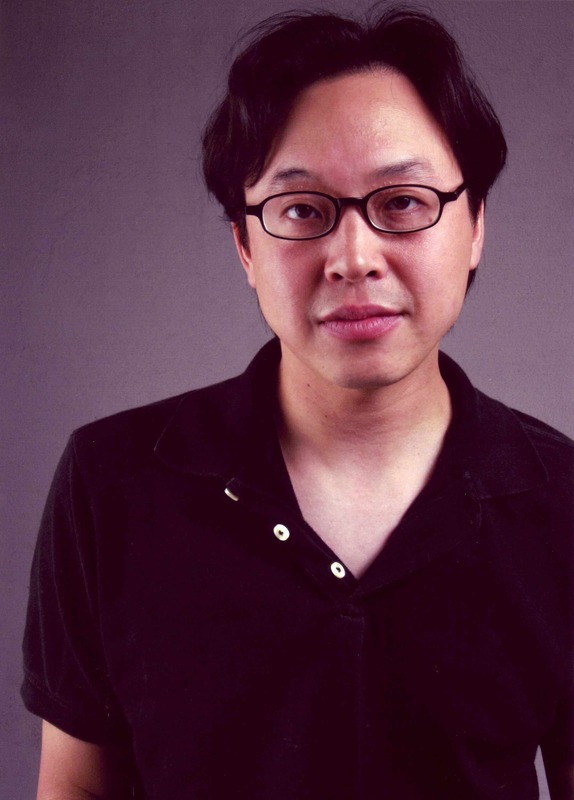 Director Jeff Liu, formerly EWP’s literary manager, said the play posed some challenges. “We definitely had to find the right cast, and in some cases the right crew. For instance, the projections/subtitles operator really needed to be bilingual, and has one of the harder jobs on the show. But luckily we’re in L.A., so it was mainly a matter of doing the legwork to find what was needed. The actor playing Peter had to be a Caucasian who speaks fluent Mandarin. The role went to Timms, who has been an award-winning radio and TV personality in Taiwan and China for many years. Also making her EWP debut is Wang, who has starred in several TV shows and films in China. 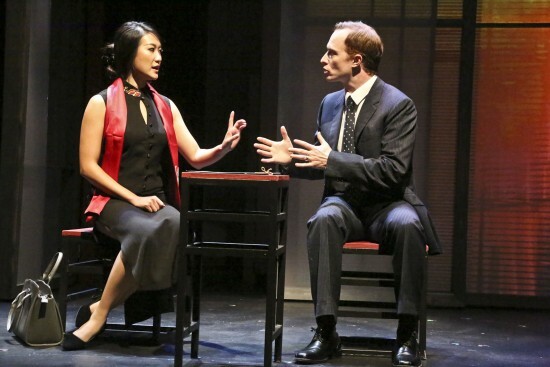 “Chinglish” premiered at Chicago’s Goodman Theatre, where it won a 2011 Jefferson Award for Best New Work, then moved to Broadway, where it was named Best New American Play of 2011 by Time magazine. It was last performed locally at the South Coast Rep in Costa Mesa in 2013. Hwang, the namesake of EWP’s theater, is known for such plays as “M. Butterfly,” “Golden Child” and the revival of Rodgers and Hammerstein’s “Flower Drum Song.” He has also done extensive work in opera, television and film, and is working on the movie adaptation of “Chinglish,” which will be directed by Justin Lin. Liu previously worked with Hwang on a feature adaptation of his play “Yellow Face” — a comedy based on the controversy over the casting of a Caucasian actor in an Asian lead role in “Miss Saigon” — for the YOMYOMF (You Offend Me, You Offend My Family) Network on YouTube. “It’s a film/theater hybrid, free for anyone to check out at any time,” Liu said. The cast of “Yellow Face” includes Ryun Yu, Sab Shimono, Ki Hong Lee, Linda Park, Emily Kuroda, Justin James Hughes, Tracy Winters, Michael Krawic and Christopher Gorham. “Chinglish” runs through Oct. 11 at the David Henry Hwang Theatre, 120 Judge John Aiso St. in Little Tokyo. Showtime: Wednesdays through Saturdays at 8 p.m., Sundays at 2 p.m. Tickets can be purchased online at www.eastwestplayers.org or by calling (213) 625-7000. Prices range from $28 to $38. Student and senior discounts available.